WASHINGTON — President Trump made clear Thursday he is determined to get his wall. But his demands, and occasional threats to shut down the government over funding it, belie the stark reality facing his administration: Nine months into his presidency, there is no plan for constructing the kind of wall the president promised his voters for two years. A study Trump ordered in January on how to fully secure the border has not been completed. His transition team focused on immigration enforcement plans with greater chances of success. Proposed wall prototypes — which officials had hoped to deploy this summer — are months behind schedule. Construction firms have stayed away amid the prospect of political retaliation. And new NBC News polling suggests only lukewarm support for a wall the president today said would happen. It's a familiar refrain in the Trump era: a major presidential priority that Trump insists will be realized while leaving essential details unresolved. He warns of political consequences for Republicans who stood in the way of legislation to repeal and replace Obamacare even as lawmakers privately questioned his grasp of the issue. And his first moves in a major tax reform push have been similarly big on promises but short on details. Trump insisted Thursday he wasn't backing down on his campaign promise, even as Democratic leaders said the president had offered the night before to support legislation to protect so-called Dreamers in return for a more scaled-down border security plan. "They cannot obstruct the wall," he told reporters in Florida. "The wall, to me, is vital. If I don't get the wall, then we will become the obstructionists." The president's pledge to build a "big, beautiful wall" and crack down on illegal immigration unquestionably fueled his campaign for the Republican nomination. But support for his position among the broader electorate is thin. A new NBC News/SurveyMonkey poll finds that just 41 percent of Americans support the idea of building a wall along the entire U.S. border with Mexico, while 56 percent oppose the idea. Seven in 10 Americans say it is unreasonable of Trump to threaten to shut down the government if Congress doesn't fund construction of the wall. Only 6 percent of those surveyed said they expect Mexico alone to pay for construction of the wall — a key component of the president's pledge; 60 percent said U.S. taxpayers would ultimately pay for it, while 31 percent said both the U.S. and Mexico would. Key advisors who came with Trump to the West Wing worked during the transition to draft executive orders calling for strict new immigration policies. But planning on the wall only went so far, with relevant agencies like Customs and Border Protection identifying areas where construction could begin quickly — essentially the low-hanging fruit of border security projects. "We spent a lot of time doing things we could, and not a lot of time doing things that could not," said James Carafano, a national security and foreign policy analyst for the Heritage Foundation who was part of Trump's Homeland Security transition team. Days after his inauguration, Trump signed an executive order calling for "the immediate construction of a physical wall on the southern border," and directing the Department of Homeland Security to produce a comprehensive study within 180 days that would include a description of resources needed to achieve "complete operational control" of it. David Lapan, spokesman for the Department of Homeland Security, said the study "is being finalized and has not yet been transmitted to the White House." In April, John Kelly, then the Homeland Security secretary, told lawmakers there was "no way" he could give an estimate of what the project would ultimately cost, while noting it was unlikely to result in a wall "from sea to shining sea." "I don't know what it will be made of, I don't know how high it will be, I don't know if it's going to have solar panels on each side," said Kelly, who has since become the president's chief of staff. For its part, CBP — the agency that would ultimately play a lead role in the project — says it has begun taking "all appropriate steps" to begin fulfilling the president's mandate. In March, it initiated the bidding process for concrete wall barriers as part of a pilot study, using existing agency funds. It took five months to announce the first recipients of contracts for wall prototypes in a high-traffic area of San Diego — a delay that denied the White House a photo op, a groundbreaking event that would perhaps include the president himself. David Raymond, the president and CEO of the American Council of Engineering Companies, said this project was in "a special zone of concern because of the political implications for participation," compounded by the lack of clarity from the administration about the ultimate scope of the project, and the political sensitivity surrounding it. "I'm just not sure that this thing is cooked yet," he said. "All things considered, the risk of being listed as interested in such a project … was considered not a risk worth taking considering that the project itself was not well defined." California, the nation's most populous state and a bulwark of opposition to Trump, is among the largest jurisdictions threatening to deny government business to any firms who sought contracts from the administration for border wall construction. That threat has had a chilling effect on bidding, with contractors large and small making a simple risk-reward decision about involvement in a project with an ill-defined future, Raymond said. "There's another issue related to that, which is whether the federal government, by virtue of the fact that firms backed off, is getting the best possible know-how for this project," Raymond added. Then there's the problem of where to build the wall, as much of the land along the Texas-Mexico border is privately owned. Elaine Duke, now acting secretary of DHS, testified before Congress in March that land acquisition would be "a major issue if additional wall is constructed." 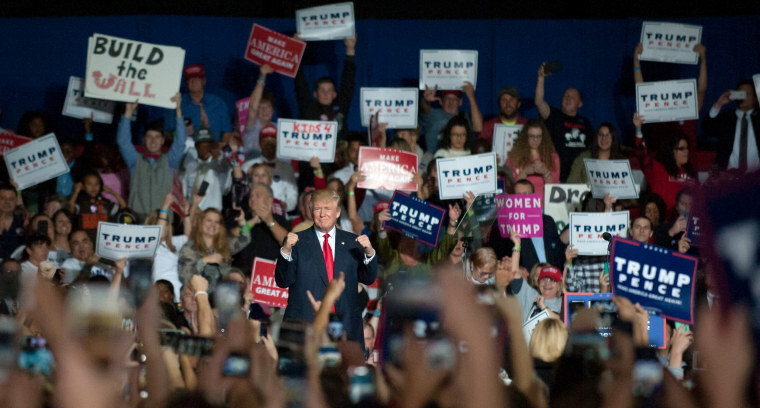 Mark Krikorian, the executive director of the Center for Immigration Studies, which advocates greater restrictions on immigration, said he was always "ambivalent" about Trump's campaign pledge on the wall given that it was "going to be more problematic, more difficult than he imagined." The federal government is still working to resolve 90 outstanding cases related to land acquisition efforts, according to CBP data provided to the Senate Homeland Security Committee. Krikorian says the number of outstanding cases would likely grow if Trump's border plan went ahead, with challenges potentially supported financially by the president's political opponents. "Texans are ornery," he said. Even if they're for enforcement they're still going to be ornery about it." While estimates of what it would cost to fully secure the nearly 2,000-mile border vary — a study from Senate Democrats said it could reach as high as $70 billion — the White House this year has sought just $1.6 billion, to build 60 miles of new barriers in the Rio Grande Valley of Texas and 14 miles of secondary fencing in San Diego. One project that would receive money dates to the Bush administration, according to a government official who spoke on the condition of anonymity because of the political sensitivity of border funding issues. The fencing sought in San Diego would actually only replace an existing fence that has proven insufficient to prevent illegal crossings, the official added. What Trump actually meant in promising a border wall has always been a matter of interpretation by allies and critics alike. Carafano, the former Trump transition team member, argued that his voters never expected the completion of a physical wall spanning the entire U.S.-Mexico border. "He was speaking to the people who support him and saying, 'I understand what you want and I will deliver,'" he said. "I think most voters are smart enough to know that what he means is, you are going to cut down on illegal immigration," Carafano said. "Whether there's 2,000 miles of wall or not, they could care less as long as immigration is down." Trump has linked construction of the wall to combating a growing opioid epidemic, telling the Mexican president at one point it was key to his victory in the New Hampshire primary, a state he referred to as a "drug-infested den." But in the NBC News-SurveyMonkey poll, only 37 percent of respondents said a border wall would lead to a decrease in drug traffic to the United States, while 54 percent said it would stay the same. Forty-four percent said undocumented immigration would also likely stay the same even with a wall, while 48 percent said it would decrease. Only one in five respondents said a border wall would help the economy in their state, while a 24 percent said it would actually make things worse. Christina Lees, a Trump voter who recently participated in a focus group of Pittsburgh area voters assembled by the pollster Peter Hart on behalf of Emory University, said she indeed always viewed the proposed barrier as a "proverbial wall, not a literal wall." "A proverbial wall being setting in stone, more or less, laws and rules and regulations," she explained. The NBC News|SurveyMonkey poll was conducted online from Aug. 24 through Aug. 29, 2017, among a national sample of 10,129 adults. Respondents for this non-probability survey were selected from the nearly three million people who take surveys on the SurveyMonkey platform each day. Results have an error estimate of plus or minus 1.4 percentage points. For full results and methodology, click here.